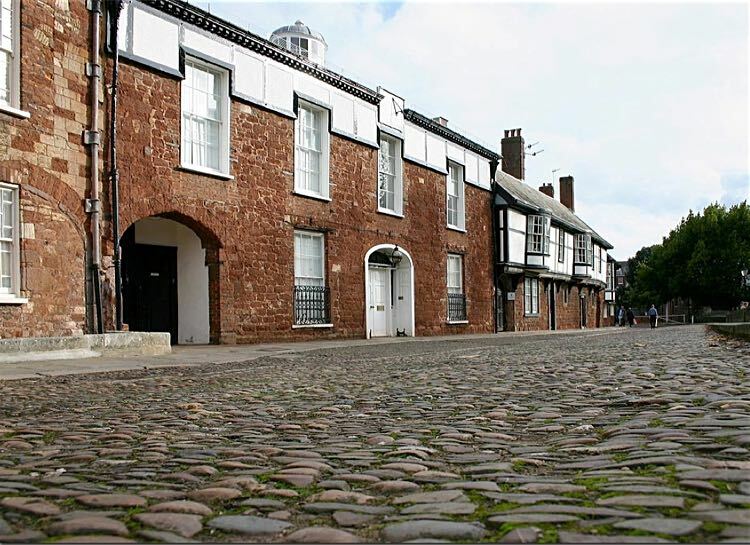 The Devon & Exeter Institution occupies a Grade 2* listed building at No.7 The Close, that can trace its heritage back to well before the sixteenth century. Originally built to house cathedral clergy, the building was remodelled in the sixteenth century. The Parliamentary General, Sir William Waller, as a young man, travelled to the continent as an English volunteer. He was knighted in 1622 for his foreign adventures, and married Jane Reynell, the daughter of a Devonshire family. The couple made this building their home. In 1662, the Earls of Devon or Courtenay family, a name long associated with Exeter, acquired the building as their town house. The house was used in April 1782 to “lay in state at his Lordship's house in St. Peter's Churchyard till the next morning, when the funeral procession left in great state for Powderham" the remains of Frances, Viscountess Courtenay who had died at her house in Grosvenor Square. The Courtenay's started devolving some of their land and property, for in 1807, the Courtenay estates in Ireland were sold for £200,000. 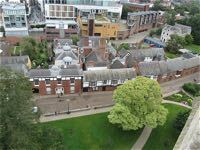 No.6 The Close, known as the Subdeanery, was increased in size, through the purchase of part of No.7 Cathedral Close. Several rooms, including a brewhouse and kitchen, were absorbed into the boundaries of No.6 and demolished. On 24 August 1813, an advert appeared in Trewman’s Exeter Flying Post stating that a committee had been formed to investigate the founding of a Scientific and Literary Society. "… form a set of rules for the government of the institution… Gentlemen wishing to become Proprietors who have not yet subscribed their names, are requested to signify their intention to the Right Worshipful the Mayor..."
At an inaugural meeting at The Hotel (Now the Royal Clarence) on 12 August, shares were issued at a cost of £25 each. By January 1814, 51 members had paid for their full allotment of shares, while 76 had purchased a portion with their first years subscription. £2,560 was raised, of which, £2,000 was invested in exchequer bills, until such point that the funds were needed. Originally the Institution occupied two rooms in Mrs Bath’s establishment in the High Street. Early contributions included a sledge and canoe from the Arctic for the fledgeling Institution. However Mrs Bath’s patience broke when she answered the doorbell to find a 7ft stuffed bear standing on her doorstep, and a carriage pulling away in the darkness. The sooner a permanent home was found for the collection, the better. The ‘house committee’ purchased the lease for the Courtenay town house, and plans were drawn up to add galleries for the proposed reading rooms, a library, lecture room and museum. It was hoped that part of the house would be occupied by the spring of 1814. When the Institution first occupied the property it consisted of the house with a hall and kitchen surrounding a large courtyard. The rooms for the library were constructed in the courtyard—there is a gallery around each library and both are naturally lit from above. The front of the building was given a Georgian makeover. Plans were made to add a lecture room to the Institution in 1834. However, as there was no space at No.7 The Close, it was decided to buy a suitable site elsewhere. A plot, next to the Episcopal Chapel, or Atheneum, in Bedford Circus, was acquired and approval given by the owner, the Duke of Bedford. The building was designed by John Tyrrell Esq., and built by Mr Thomas Wills Horrel. The building was lost in the May 1942 bombing. The aim of the Institution was to promote the arts and sciences in the west country, and provide a meeting place for gentlemen to meet and discuss both local affairs and affairs of state. Although there was no lecture room in the building, an early talk was given in November 1815 by Mr Bakewill on geology. Members donated further specimens in natural history, medals, coins, pictures, drawings, engravings, manuscripts, and other objects for the formation of a ‘respectable library and an interesting museum’. Albert Memorial Museum. —A large donation of interesting objects, has been presented by the committee of the Devon and Exeter Institution, including an Egyptian mummy, an Esquimaux canoe, Burmese goddess, skulls of walrus, Narwhale, &c.
William Kendal was an earlier benefactor to the Institution when he donated a number of books during its first three months. He also donated two important paintings by Luny, one of which depicted the siege of Algiers. On another occasion he gave £100 to expand the library, a large sum at the time. His philanthropy ended in March 1832, when he was found drowned at Knowles Bridge in Bovey Tracey. There is still a voting box in which members once used black and white beans, denoting nay or yea, for a prospective member. "... collection of materials for local history, has been deprived, for the purpose of screening it, of an infinite variety of current facts, which are no where preserved, but in the County Papers." The ban was not implemented, and the Institution has the finest collection of bound copies of the major Exeter newspapers for the nineteenth and early twentieth centuries. The next year, in coldest January 1821, Captain Parry of the Northern Expedition visited the Institution to consult the library. He was dressed as though it were a hot summer day, having become accustomed to extreme cold during his first expedition, as commander of HMS Hecla, to the North West Territories of Canada, in search of the elusive North West Passage. The Caledonian Mercury noted that on Wednesday 22 January, the Institution's meteorological station recorded a temperature of 22 Fahrenheit (-5.5 Celsius), so the Captain must have been feeling quite uncomfortable in the unaccustomed heat. Many of the members of the Institution travelled the world, either as collectors or in the British Army and Navy. They brought back many unique items, which they donated to the Institution. The Devon and Exeter Institution donated more of its collection to the new museum in Queen Street, including the large Caleb Hedgeland model of Exeter in 1872, thus relieving the pressure on the bookshelves. 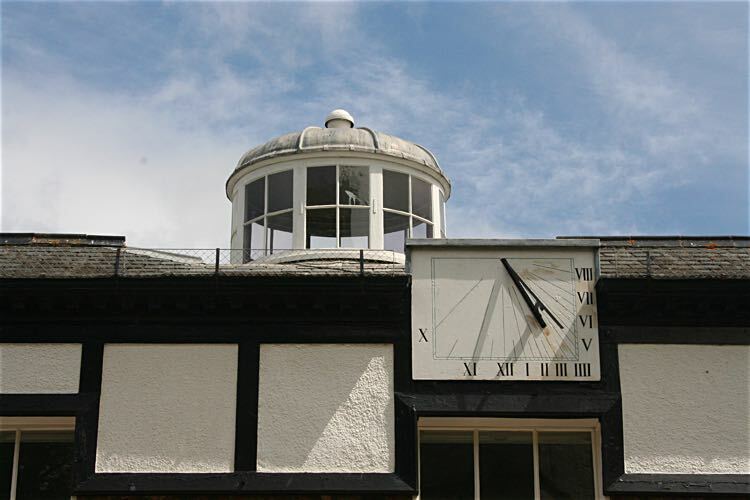 In the 19th-Century, the Institution ran a meteorological station in the garden, with measurements recorded by the librarian, which were published every week in the Flying Post, as interest in natural phenomena and weather forecasting expanded. In October 1862, a wind speed reached the limit of the anemometer, and the barometer fell to 29.020 inches (mean for month 29.902), both measurements obviously worthy of comment. The librarian, Mr Parfitt, wrote a piece for the Flying Post during the July 1870 heat wave, when he reported the maximum temperature reached was 85.5 F. In the true spirit of analysis he stated that in July 1835 it had reached 86 F.
Meteorological measurements were still being made, and reported, as late as the 1950s. The librarian is an important post and during the 19th-Century, three librarians in particularly are remembered. Mr Squance held the post for many years, and on his death in December 1849, his daughter Miss Squance was elected in his place. Mr Parfitt replaced Miss Squance, and was just as active, with the meteorological station. He had an inquisitive mind and in 1873 he investigated a vein of quicksilver, said to exist at Head Weir; he concluded that the quicksilver had been placed there or had arrived by accident. Mr Parfitt died in February 1898 and Mr Alfred Richard Allinson MA, succeeded him. In the same month that Mr Parfitt died, the Committee decided to divide off part of the reading room as a smoking room for the use of members, a concession that no longer applies in modern times. Electric light was installed by 1897, supplied from the generating station in New North Road. A story goes that when the Institution first installed a telephone in 1899, some members were keen to use the new device, as few of them had a telephone at home. Some circumvented this inconvenience by going to the Devon and Somerset Stores, who also had a phone, where they browsed the goods in the shop. They would then return to the Institution and loudly phone the shop to make their weekly order, ensuring their fellow members could hear their conversation. 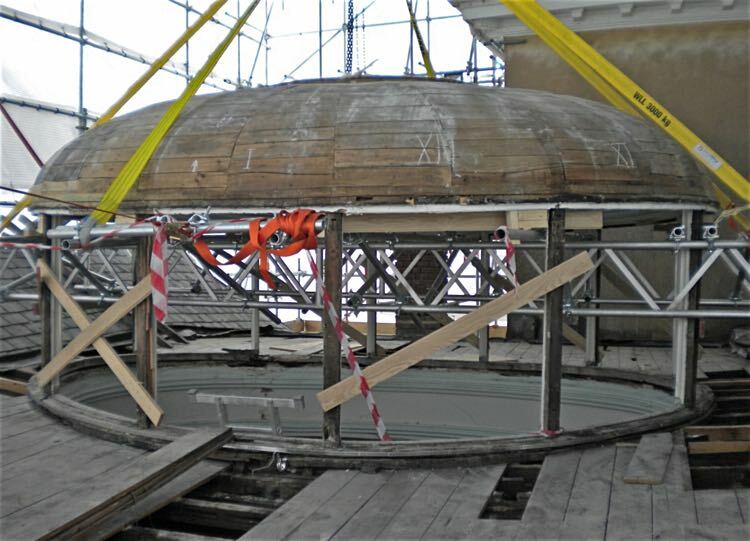 The Devon and Exeter Institution is still running, despite extensive repair work having to be made to the domes. 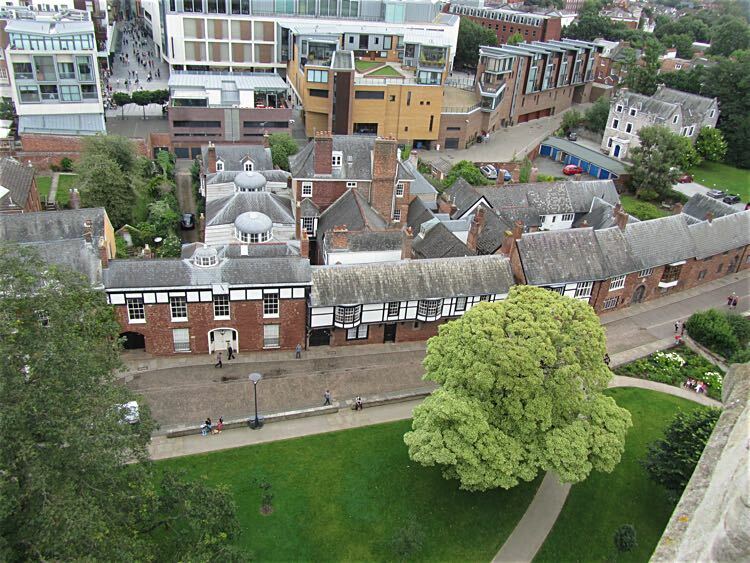 The library, holding 40,000 books devoted to Exeter and the West Country, and its historic newspapers from Exeter and the south west, is an important resource for anyone studying local history. Since 1989 it has been a registered charity and has in excess of 700 members. Source: Trewman's Exeter Flying Post, Exeter and Plymouth Gazette and the Times. Besleys Directory. 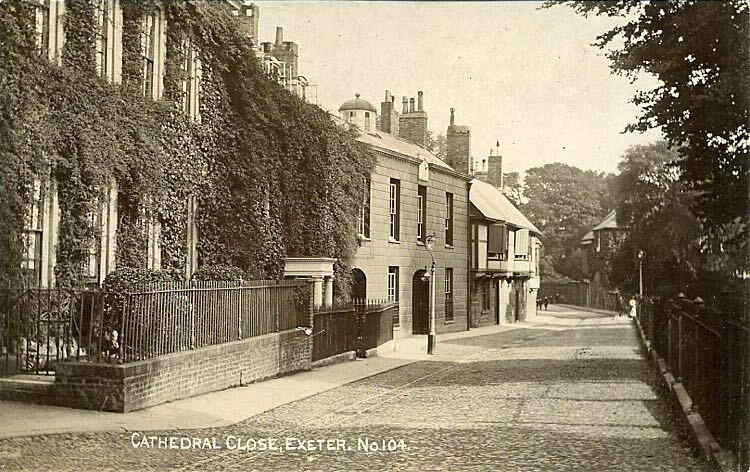 The History of the City of Exeter by Alexander Jenkins. A history by Roger Brien. The Institution in Cathedral Close. The twin domes can be seen in this view from the north tower of the Cathedral. Photo courtesy of Nadezhda Keenan. The sundial on the front. 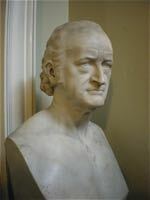 A bust of Sir John Bowring can be seen in the Institution.